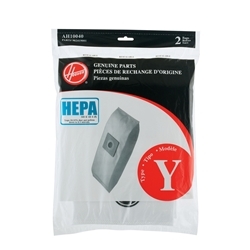 For all Hoover upright vacuum cleaners using type Y or Z bags. Provides increased cleaning efficiency and superior filtration over the standard paper bags. HEPA bags trap 99. 97% of all particles the pass through the bag, down to 0. 3 microns. Traps 100% of dust mites and their eggs. Traps 99. 98% of ragweed and common Grass Pollens. Filters and wide range of airborne particles, including many pollens, cat dander, spores and other allergens. Electrostatically charged liner enhances the capture of extremely fine particles. Ideal for many with allergic or dust related discomforts. If you have allergies, these bags are a must. Hoover Synthetic Y bags feature the best in filtration for your Hoover Windtunnel Upright Vacuum Cleaner. The NEW Activated Carbon absorbs household odors while mantaining the highest quality of filtration. These bags are a must for pet owners.